J Swygart | The Lima News Lima Police Department detective Steve Stechschulte was the lone witness called to the stand during a Tuesday morning motion to suppress hearing for Marchion Williams in Allen County Common Pleas Court. 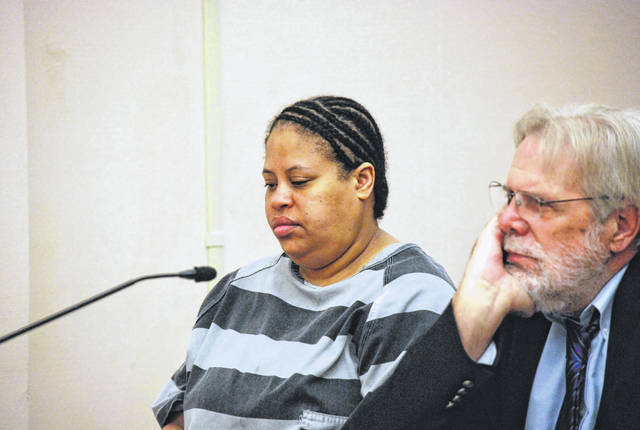 J Swygart | The Lima News Marchion Williams, 40, appeared in Allen County Common Pleas Court on Tuesday for a hearing during which her attorney, William Kluge, attempted to have portions of her statements to police ruled inadmissible at trial. Williams is charged with the murder earlier this year of Lima resident Eddie McClellan. LIMA — The attorney for a the woman charged with murder in the March stabbing death of Lima resident Eddie McClellan argued Tuesday that his client was not properly read her Miranda rights prior to being interviewed by police. Attorney Bill Kluge told Allen County Common Pleas Court Judge Jeffrey Reed that his client, 40-year-old Marchion Williams, gave her statements to police “involuntarily” after being taken into custody on the morning of March 14. Kluge said Williams “had no sleep, had been drinking all day (leading up to McClellan’s murder) … and had no time to reflect on her rights, no time to talk with family and no time to get a lawyer” before being interviewed by Lima Police Department detective Steve Stechschulte in connection with the 65-year-old McClellan’s death. The comments came during a hearing to address a motion filed by Kluge to suppress statements made by his client during the police interview. Stechschulte was called to the witness stand and testified that Williams was made aware of her constitutional rights on more than one occasion prior to the formal interview. The detective said he first advised the defendant of her rights immediately upon her arrest, and did so again several hours later when the formal interview got under way. The detective also contradicted Kluge’s assertion that Williams was drunk at the time of the interview. “She said she was sober and was willing to talk about the incident,” Stechschulte testified. “She did not appear intoxicated and there was no odor of alcohol” on her person. A recorded copy of the interview was entered into evidence and Reed said he would review the contents of that disc before ruling on the defendant’s motion to suppress. According to court documents, Lima Police Department officers were dispatched at approximately 12:30 a.m. on March 14 to 605 Fairview Ave. in reference to a stabbing. Upon their arrival they found McClellan, who had been stabbed multiple times. The man was transported to Lima Memorial Health System, where he was pronounced dead shortly after arrival. Police then began a search for Williams, who is listed in court records as “homeless,” to question her about McClellan’s death. They found her at 5:45 a.m. at a residence on South Union Street, a location Stechschulte described in court Tuesday as “what I call a smoke house, a place where people go to smoke crack” cocaine. Stechschulte said Williams knew the victim had been living at the Fairview Avenue residence “for a few days” prior to the incident. The detective testified on Tuesday that Williams had “a large amount of blood on her … and we found Eddie McClellan’s wallet in her pocket” when she was taken into custody. 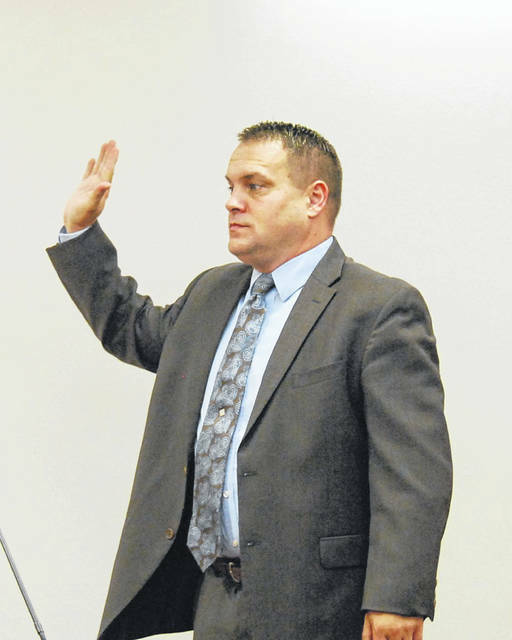 https://www.limaohio.com/wp-content/uploads/sites/54/2018/07/web1_Steck.jpgJ Swygart | The Lima News Lima Police Department detective Steve Stechschulte was the lone witness called to the stand during a Tuesday morning motion to suppress hearing for Marchion Williams in Allen County Common Pleas Court. https://www.limaohio.com/wp-content/uploads/sites/54/2018/07/web1_Marchion-WIlliams-1.jpgJ Swygart | The Lima News Marchion Williams, 40, appeared in Allen County Common Pleas Court on Tuesday for a hearing during which her attorney, William Kluge, attempted to have portions of her statements to police ruled inadmissible at trial. Williams is charged with the murder earlier this year of Lima resident Eddie McClellan.